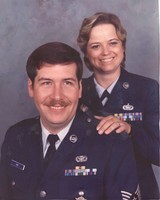 This is Mark and Judy Rine. Judy went to live eternal in heaven this past week. My best memories in Germany were with Mark and Judy. Please keep Mark and the Rine family in your prayers. Judy Dee (Jackson) Rine, 62, died July 25, 2015. She was born Aug. 2, 1952, to Henry Frank and Mildred Deloris (Heart) Jackson. She married Mark Rine Dec. 21, 1981. He survives. Memorial Service 10:30 a.m. (MDT) Monday at United Methodist Church, Tribune. Memorials to VFW Post 7521 or Kansas Honor Flight, in care of Fellers Funeral Home, Syracuse.